Last week it delighted me to catch up with the hilarious Ben of BsideBlog at the Black Cat Cafe on Fairfax. Together we enjoyed this Gluten Free Chocolate Brownie. 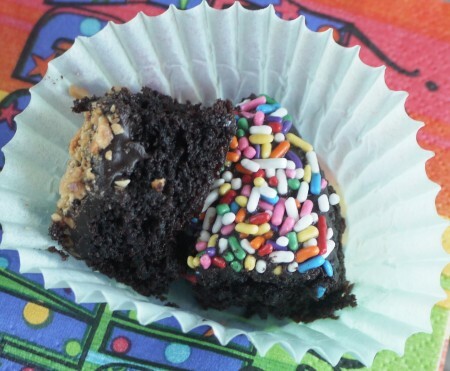 The brownie’s consistency resembled a cake more than anything, but the yummy frosting on top and chocolate chips throughout yielded the necessary richness to make this dessert a satisfying chocolate experience. Additionally, I’ve enjoyed all my savory meals at the Black Cat Cafe. Yay- I love me a good neighborhood joint with fresh, healthy options (chocolate and all ;)). For more info on the Black Cat Bakery, click here. Yay! 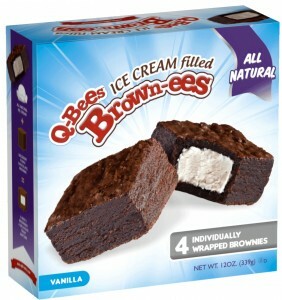 You might remember this post about these awesome, all natural, ice cream filled “brown-ees” by Q-bees. 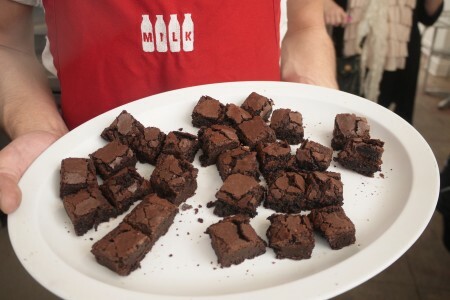 Well, the amazing people at Q-bee treats are sending FIVE fans a FREE box of ice cream filled brownies if you tweet me, mention my ebook, or #Follow @DessertDarling, and #Brownees. I’ll put all the Tweeters names in a hat and the first 5 I pull get a free box in the mail. How EASY is that?! Fun fun. I’ll announce a winner next week. 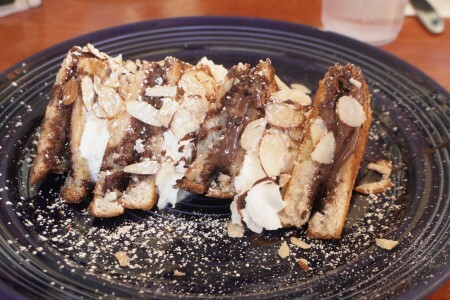 ps: I’m SOOOOOO Craving a Q-bees Brownee right now– AhhhhhH! Golden Cherry for TOURific Escapes Chocolate Indulgence Tour of LA! 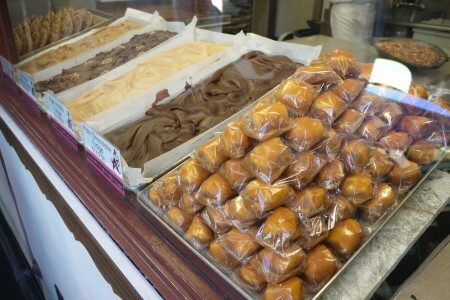 Yesterday I had the greatest time on the TOURific Escapes Chocolate Indulgence Tour of LA. 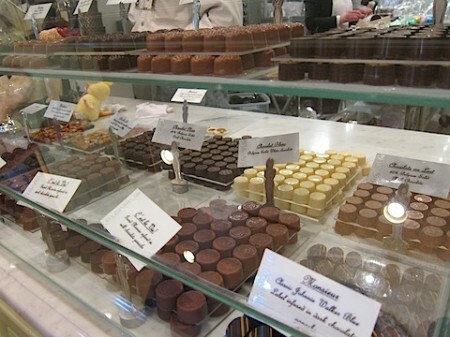 My friend Lynn invited me along to be her partner in crime for the day to sample some of the city’s tastiest chocolates. I really can’t express to you how much fun I had. Knowledgable husband and wife team, Matt and Trish, lead the way with such passion and joy that the three hour tour flew by in a blink. Below is a sneak peak of just some of the goodies we tried with reviews to come next week. 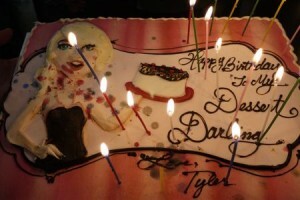 To see more delightful images, check out Lynn’s post at the The Actor’s Diet and stay tuned for next week’s reviews! For more info on TOURific Escapes, click here! I love the Coral Tree Cafe. With all natural, organic ingredients, fresh salads, delicious brunch, and a Golden Cherry Mousse Cake (see here), what’s not to love? 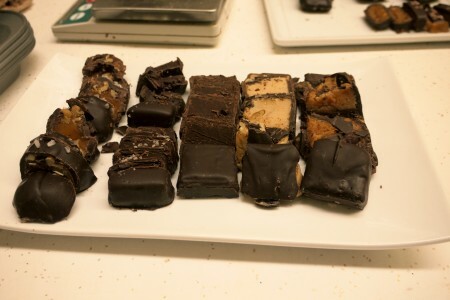 Um, their Gluten Free desserts… they’re very unlovable. Below you see a large Chocolate Chip Cookie (yea, where are the chocolate chips??) and a Chocolate “Fudge” Brownie. I put “fudge” in quotation marks since there’s nothing fudgey about this brownie. Indeed, both selections were tragically dry and crumbly, which confuses me since Gluten Free does not mean Butter Free.. or salt and sugar free. I mean, come on guys! Give us gooey butter and flavor at least! The bland, crispy cookie with its air pockets was the worst. At least I enjoyed eating the frosting off of the brownie. 1 cherry for the cookie, 2 for the brownie, resulting in an a 1.5 cherry rating. 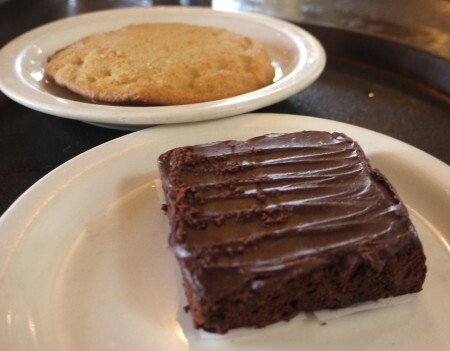 For more information on the Coral Tree Cafe and their Southern California locations, click here. The 2011 GOLDEN CHERRY AWARDS! Another great year of sumptuous desserts has come to a conclusion. While these new-comers stood out as clear and worthy winners, some honorees from years past had no competition to knock them off their Golden Cherry standing (old winners not shown). 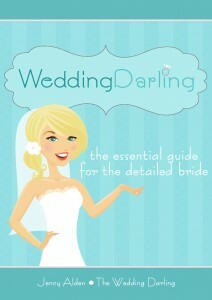 Without further ado and a little drumroll please………. With high quality dark chocolate shells, creative flavors, and rich centers, 95th Street Bakery wins this year’s Golden Cherry for best cake ball! Unfortunately, these treats are only available in the S. California region and don’t have a Golden Cherry shelf-life (they drop to 4 cherries after refrigeration) so get them fresh! BEST CHOCOLATE CHIP COOKIE : Baking Betty’s. 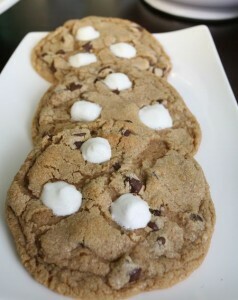 These dainty chocolate chip cookies with sweet mini marshmallows just beat out the much heartier Cookies By Joey for the Golden Cherry. When nearly every wedding guest raved about these cookies that we stuffed into our Welcome Bags, I knew they were a sure a crowd-pleaser and this year’s winner. 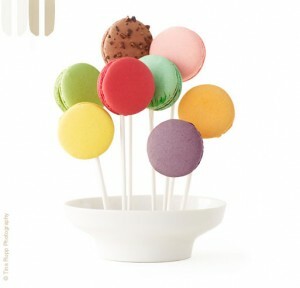 Formally known as Paulette Macarons, these colorful confections just beat out Mad Mac NY Macarons for two reasons: 1) greater variety with prettier design and 2) the Mad Mac pastry chef is a total snoot on Cupcake Wars. 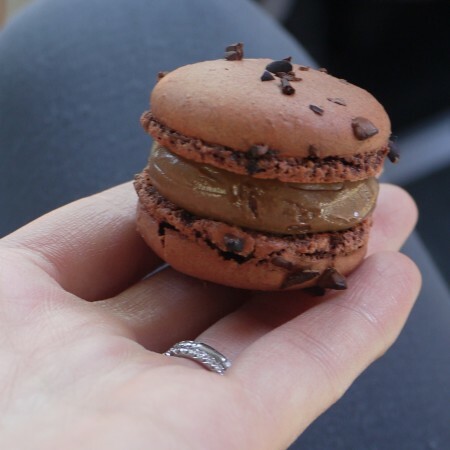 Lette’s haut couture macarons boast unique flavors like violet cassis and caramel, melt in your mouth, and got my husbands enthusiastic thumbs up (he never likes sweets). These naturally low-fat cookies make the perfect gift or personal indulgence for any time of year. With a freshly baked and piping hot brownie under a heaping scoop of vanilla ice cream, this decadent dessert is a party on a plate. I recommend celebrating this masterpiece with a friend! 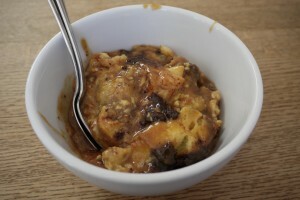 The heavenly Caramel Chocolate Bread Pudding at Huckleberry Cafe in Santa Monica is an ooey gooey bowl of buttery sin that I want to swim laps in. For those who prefer more dry and traditional bread puddings though, this custardy option isn’t for you (try the muffin version at the Larchmont Bungalow instead). While I’m not normally a Baklava fan, Bakluvit makes sweet and flakey bars that revolutionized the treat for me. 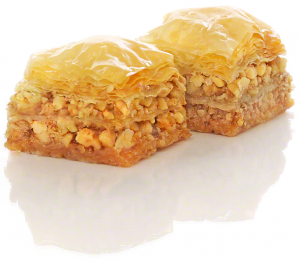 With original, chocolate, butterscotch, and seasonal flavors, these perfectly balanced Baklava squares make a surprisingly wonderful alternative to more traditional party treats. 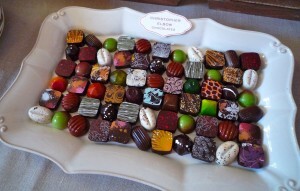 These gorgeous, chocolate gems melt in your mouth with outstanding textures, intriguing flavors, and the finest ingredients, making the steep price-tag of $2 a piece worth the indulgence. Mmmmmm! I can’t wait to see what 2012 has in store for me! Thank you so much for an incredible year!!!! Hubba Hubba. 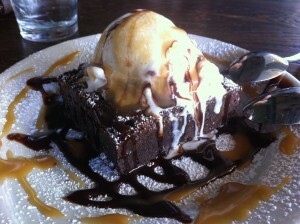 Well it’s clear why this dessert is literally trademarked as “The Famous Farm Brownie Sundae”!!! It not only looks mouth-wateringly delicious, but also it tastes like a dream come true. Who knew you could have such a piping hot, freshly baked brownie underneath all that cold vanilla ice cream!? 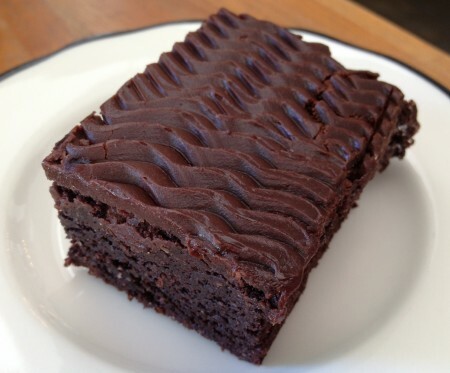 This brownie came straight from the oven and tasted the way mom makes it (from Scratch!). Naturally, the ice cream tempers the heat of the brownie and the festive Caramel and Chocolate sauces adorn our dessert with sumptuous flavor. While I intended on only taking a few bites, I simply could not control myself- a true sign of a 5-Cherry dessert! Bravo! For more info on The Farm and its Southern California locations, click here. 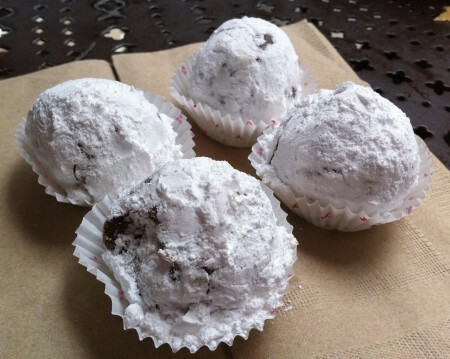 I bought these Chocolate Truffles from Mrs. Beasley’s (which has now joined forces with Cheryl’s) for my friends at lunch today. 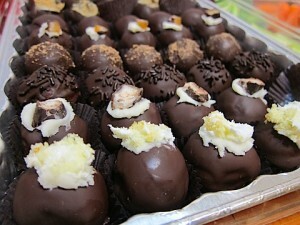 The girls absolutely flipped for these rich, cakey, fudge balls. While I had to agree that the consistency was to-die-for… somewhere up in the category of cookie-dough heaven, I thought they could use a little more cocoa. 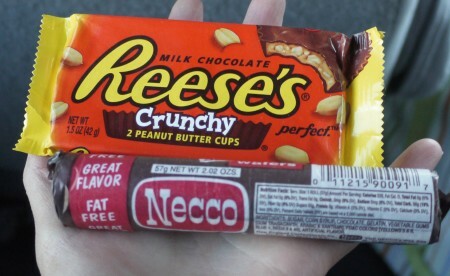 I could clearly taste butter, salt, and sugar, but craved a deeper chocolate flavor to perfect this treat. Alas, it is a Friday, and in honor of my girlfriends, I shall round up and grant Cheryl’s/Mrs.Beasley’s Chocolate Truffles five full cherries. 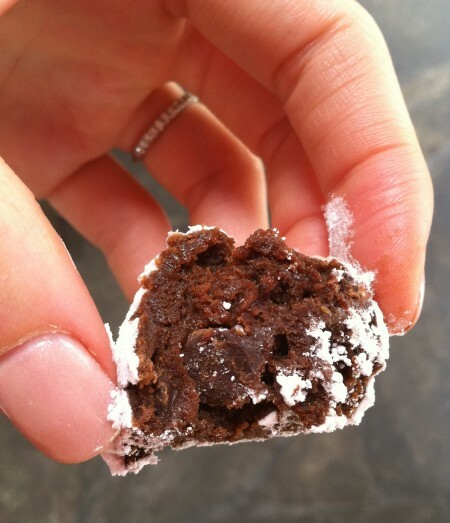 That said, if you want a similar, chocolate-fudgy treat that totally nails it, check out the Chocolate Decadence cookie at Deluscious Cookies! For more information on Cheryl’s/Mrs.Beasley’s, click here.